A fine and light looking knee high compression stocking for anyone travelling long distances, these ladies’ SockShop 40 Denier Flight and Travel Socks are made with a helpful graduated factor 14-18 compression to promote good circulation on long haul flights and even car, coach and train travel, protecting against the risk of blood clots and dangerous DVT. SockShop 40 Denier Flight and Travel Socks can prevent swelling and stimulate blood flow. 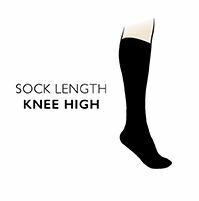 They are knee length with an attractive sheen finish and a soft feel, so they can be worn without anyone suspecting that they are compression wear.